Travel: What it’s like to visit China – Beauty and the Beasts (Foreigners) | Save. Spend. Splurge. They stared a lot but were friendly for the most part. Or at least I assumed they were friendly. Who are these strangely dressed foreigners, taking the subway with us? How curious! Are they not rich? Can’t they afford a taxi? What they did do, was take a lot of “discreet” photos. By discreet, I mean NOT DISCREET AT ALL. Girls were shy in trying to take pictures, and were pointing and staring in little groups, like giggling minnows. The boys were a bit more aggressive in wanting to take pictures, and would come up in broken English to gesture at their camera, gesture at us, and make a clicking photograph-taking sound. Young high school students posing for us. The older couples who had lived their whole lives in the countryside and had NEVER seen a foreigner in their lives, except on TV (it was obvious by the way they were dressed and the way they acted, like farmers for the first time in a big city), were even LESS inhibited, and would literally run up, grab our arms and smile for the cameras, flashing the “V” for Victory sign with their fingers. This didn’t freak us out (well it did at first, we thought we were being robbed), but after a while, it became normal for them to basically gawk. The tourists who got the most attention of all, were the black ones. There was one black guy we saw who could basically walk through tourist-y crowds at the Imperial Palace and part them like Moses through the Red Sea. This guy was smirking a bit, knowing that it was because he was black, and I could see some Chinese kids wanting to run up and basically touch him to see if his dark skin and his curly hair was real and not a costume. 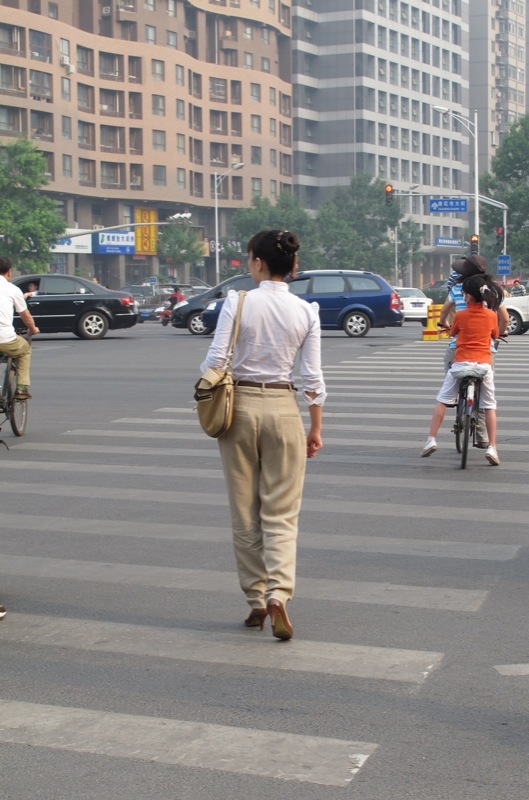 If you’re a foreigner in China, you’re GOING to get noticed, so be prepared for that. They were kind of gawking at the way we looked, but I guess we were a bit odd, even for foreigners who were touring the country. For the record, I was wearing brightly coloured sweat-wicking tops, comfortable baggy pants, hiking boots, and a Tilley hat. That’s my “Tourist Mode” of dress, because I care less about appearance when I am out to sight-see, and I care more about NOT getting blisters versus looking cute. Even by MY standards in Canada, I would look odd… but not totally out of place. I’d look like some granola-crunching hippie tourist who hates wearing skirts and dresses. Look at those English tourists! They look so funny! Here’s a shot I got of a monk looking at us curiously. He couldn’t stop, our clothing was like a curious SERIOUS trainwreck for him. Curious monks who have probably seen SOME foreigners, but not ones as odd as us. The androgynous look is not really “in”. They want to look girly. 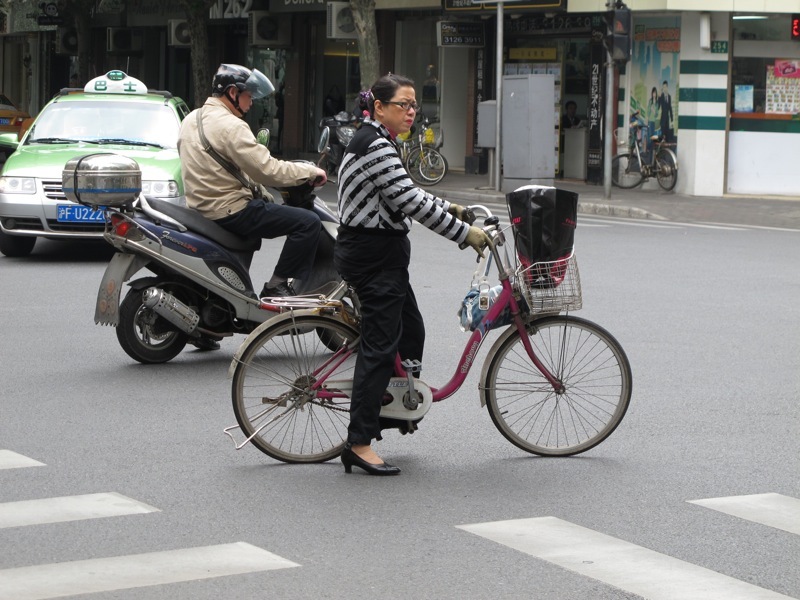 Heels, makeup and girliness are a big thing here even on bikes. Middle-aged woman dressed up for work. Women in China under the age of 30 who are considered stylish, tend to dress really girly and young. I’m talking ruffles, bows, glitter, and lots of makeup. And they are ALL IN HEELS. All the time! Sky-high heels. I don’t even know how she manages. Men also try to look decent, but they dress like other guys in North America, so there wasn’t a huge difference. Suits, t-shirts, jeans and polo shirts with sneakers are the universal uniform of young guys. I was a tourist walking 15 hours a day, but there was NO WAY IN HELL you could get me in heels. Why would she willingly want to look like a boy? How did she land a boyfriend? She’s SO horribly dressed and not at all like a girl! I was more amused than insulted, because I knew I’d never see these people again, and frankly, I was comfortable and burn-free. All of their beauty products seemed to highlight whiteness as a redeeming factor. Chinese women who were tourists, were in hats, and wearing sun protection (the best they could). Even then, they’re in heels, not flats! At any rate, sun protection is a big thing in China. They wear hats, or have umbrellas to shade off the sun to stay looking as white as possible. They have their own sense of style, and it is pretty recognizable with their huge hats, short stockings in heels, love of a logo on handbags, and heels. It’s not my style, but it is a style, nonetheless, and they try their best to look as feminine as they can. ← There’s such a thing as a “free” lunch in France! Hahah!! True. It must be interesting being a foreigner in China. I know they’re sort of treated as a novelty. We had lots of photos taken of us and so on. It seemed to make them so happy. I am loving the lady with the white shirt and khaki pants, especially that cinched waist! What city/region of China did you find you got most attention in? I would think perhaps places like Shanghai are more used to seeing foreigners, but the more rural areas would be quite different. 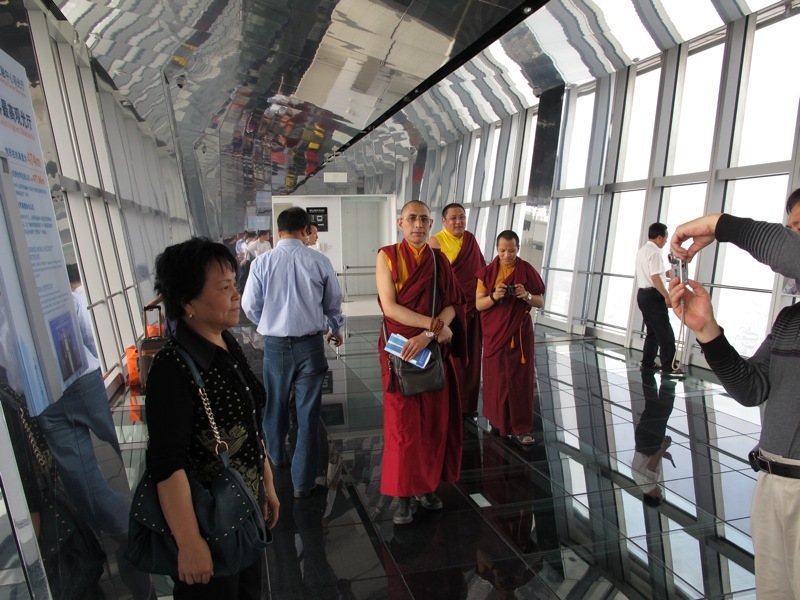 Beijing was where we were REALLY stared at the most. All the tourists visit the city capital, including Chinese countryside tourists, so you get people from rural areas out in the big city for the first time…!!! I can only imagine the pain these women will suffer in 30+ years by wearing heels constantly! We are scheduled to travel to Japan in early 2015 so I wonder how many curious stares DH and I may draw over there. Not so much, perhaps. Japan is less isolated than China, I gather but you will be stared at in the countryside. Less in the big cities of wager. Looks like both sides are curious! Thanks for another post from China. I really liked the outfit with the green undershirt. Loved the slouchiness plus the heels! They had some interesting outfits that’s for sure!